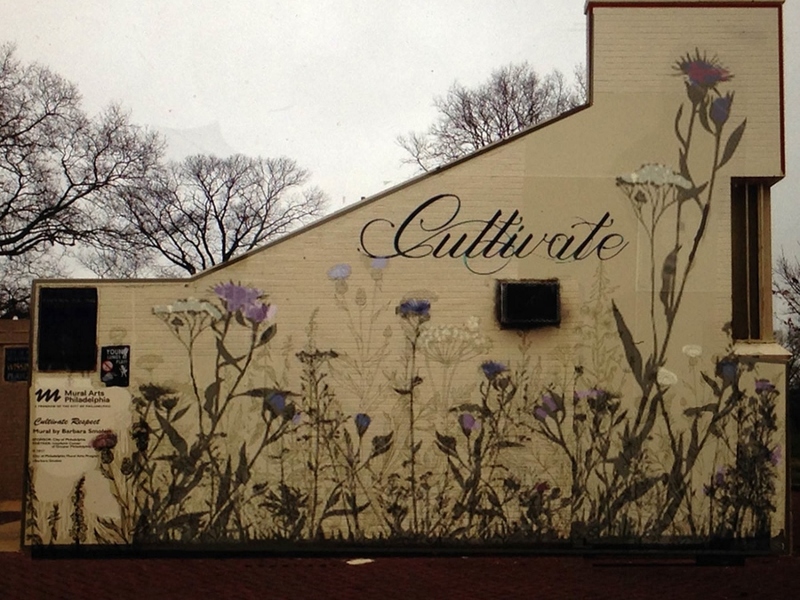 The mural "Cultivate Respect" is in Philadelphia that's adjacent to Mount Carmel Cemetery – a Jewish cemetery where vandals toppled 275 headstones in February 2017. Rabbi Rick Jacobs, president of the New York-based Union for Reform Judaism, wasn’t just speaking for Jewish people. 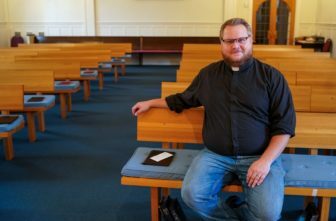 As religious hate crimes rise in America, faith groups across the country have come together to protect themselves and help others who have been been attacked for their religion. 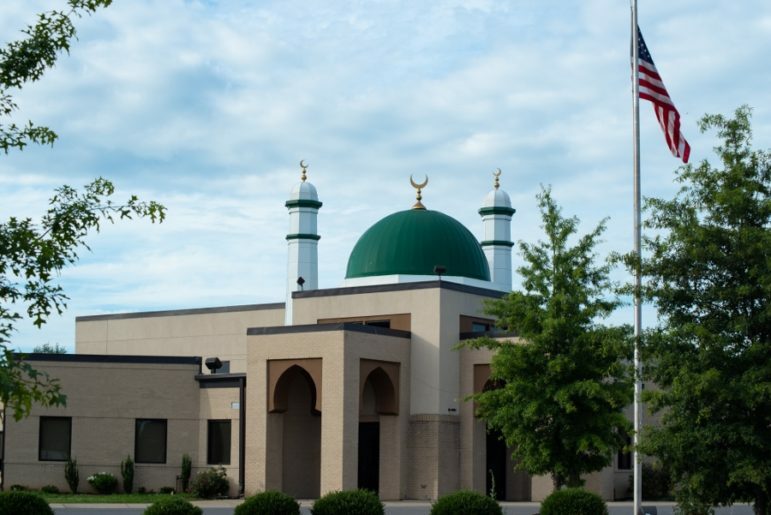 Saleh Sbenaty, the Outreach Chair of the Islamic Center of Murfreesboro, Tennessee, said the community came together after the center was vandalized in 2017. He teaches electrical engineering at Middle Tennessee State University. Jewish and Muslim communities are the most targeted religious groups, according to FBI data, and advocacy organizations report a rise in hate crimes during the past year. Anti-Semitic incidents reported to the Anti-Defamation League increased from 1,267 in 2016 to 1,986 in 2017, according to the ADL. For the first time since 2010, acts against the Jewish community were reported in all 50 states last year. Vandals spray-painted anti-Islamic slurs and threw bacon on the Islamic Center of Murfreesboro, Tennessee, in July 2017. Leaders of 20 mosques, synagogues and gurdwaras – which are places of worship for Sikhs, who often are mistaken for Muslims – around the country also found religious groups are amping up security, hosting self-defense classes and educating neighbors about religions, with simplified instruction and open houses. Jacobs, with the Union for Reform Judaism, called the August 2017 Unite the Right rally in Charlottesville, Virginia, the epicenter of hate. Hundreds of white supremacists, racists and anti-Semites – who came from around the country to protest the city’s decision to remove a Confederate statue – “joined together in their hatred,” shouting such slogans as “Jews will not replace us!” and “Blood and soil!” One woman was killed and dozens injured when a car was driven into a crowd of counterprotesters. Congregation Beth Israel, a Charlottesville synagogue, didn’t cancel its services on the day of the rally, though congregants told News 21 they were threatened by the militias and bands of armed bigots marching around the temple. Synagogue leaders became aware of potential threats weeks before the rally took place. An armed guard was hired to stand outside during Saturday morning Shabbat service, according to Alan Zimmerman, the president of the congregation. But events like the Unite the Right rally aren’t the norm for anti-Semitic hate. Most perpetrators damage property, threaten or harass places of worship. Rabbi Jacobs, who leads almost 900 reform synagogues across the country, stressed that graffiti and other crimes against Jewish property are “strong acts of anti-Semitism.” Physical desecration of a cemetery or a building is in no way innocent, he said. Jacobs said the Jewish community has at times felt vulnerable and isolated, but that’s not the case now – although working together against hate didn’t happen overnight. 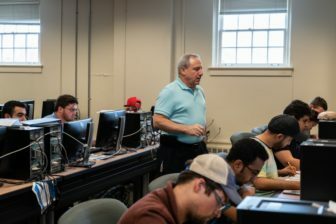 After decades of different faiths working together on other issues, such as affordable housing or combating poverty, “you build relationships,” he said. 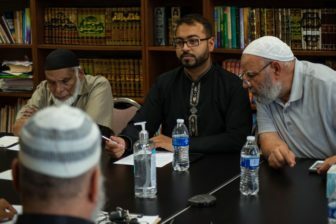 Faizan Syed (center), executive director of the Missouri chapter of the Council on American-Islamic Relations, discusses action plans with a local imam council. About 2 a.m. on Jan. 28, 2017 – the day after Trump’s executive order, which had been dubbed the “Muslim travel ban” – the imam of the Victoria Islamic Center woke up to check the mosque’s security system and saw that the doors were open. A new mosque on the same land is scheduled to open in late August, thanks to nearly 24,000 people from around the world donating $1.13 million to a GoFundMe account. It will have more security measures – cameras, lights and landscaping designed to thwart attacks by vehicles. But, on March 6, he was back in a helicopter – this time as a patient bound for the trauma room at a Portland hospital. Prabhjot Singh, a physician living in the sprawling Harlem neighborhood of New York City, was walking on a September evening in 2013 when more 20 men beat him and threw a bike at him. It was the third time he’d been physically attacked since 9/11, Singh said. 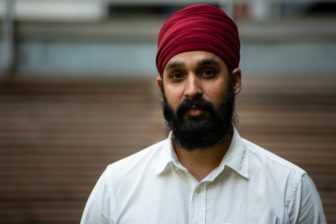 Simran Jeet Singh, senior religion fellow with the Sikh Coalition in New York City, said violence against minority groups is becoming more normalized since the 2016 presidential campaign. Simran Jeet Singh, senior religion fellow with the Sikh Coalition in New York City, said the organization has received on average one report of a hate incident per week in 2018. Every minority group has been at increased risk since the 2016 presidential campaign, he said, because violence against these groups is becoming more normalized. 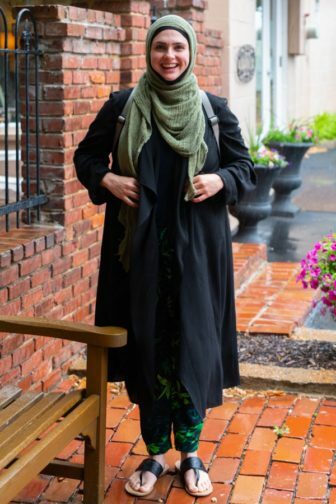 “For me as a Sikh, the aspects of my religious identity are so personal that if someone was to try and violate them in any way – that’s not an attack just on those articles, it’s not just an attack on me as an individual, it’s something much deeper than that,” Simran Singh said. Headstones of the historic Jewish Mount Carmel Cemetery in Philadelphia were restored after they were vandalized in 2017, said Laura Frank, public-relations manager of the Jewish Federation of Greater Philadelphia. Nearly 300 volunteers aided the project. Next to the cemetery, in a nearby park, is a mural titled “Cultivate Respect.” It incorporates colorful flowers, butterflies and the word “Cultivate” in cursive. About this project:This report is part of the “Hate in America” project produced by the Carnegie-Knight News21 initiative, a national investigative reporting project by top college journalism students and recent graduates from across the country and headquartered at the Walter Cronkite School of Journalism and Mass Communication at Arizona State University.